I had this light on my last bike that was stolen, in my view its still the best rear light on the market. so I hunted for months to find a replacement and SJS cycles had stock, their service is second to none and are top of my on line cycle stores. The light performs faultlessly being a good day or night light due to the different modes available. Any car driver who says he didn't see this one is downright lying! (Or certifibaly blind). Bought it to attach to rack for which it was recomended and thought there would be a straight fit, but had to resort to cable ties however it's very firm and not even Glasgow's apalling roads have shaken it loose and the ties don't interfere with the blinding light. Likje the 2 sets of setable sequences too, though it can be a lot of button pushing to get both sequences turned off. 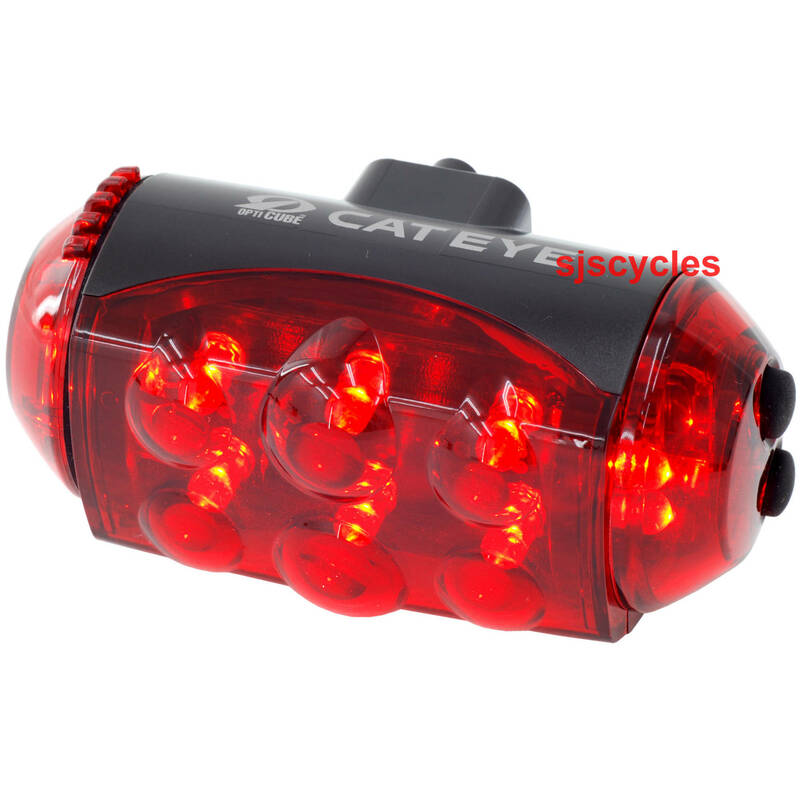 Cateye TL LD1100 awesome 10 LED that can burn your eyes..ultra bright , compact , the best taillight ever ! Warning - don't look directly into this light when you're close to it. It's blinding ! There's no WAY that anyone can claim not to have seen you from behind wit h this light. the only thing that stopped it from being a 5-star review was that when I took it off after 4 months of use, I noticed that one of the rubber on/off buttons had started to perish and had split open. I'll only find out of this is going to be a problem when the dark mornings set in and there's some rain - hopefully it'll be fine given the cost. Maybe I'll try repairing it with a puncture repair kit ! 2 AA batteries can only provide the required power for 100000 mcd during a couple of hours. From then on the light output decreases considerably. Superb rear light. With 10 LED's & plenty of flashing modes it speaks for itself.